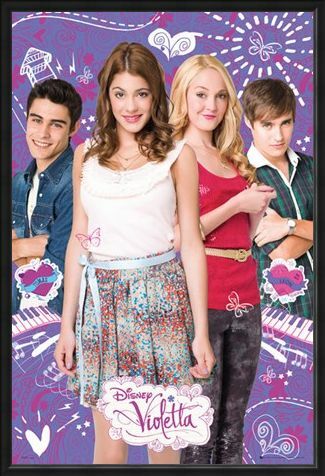 Children's TV Poster: Follow Violetta and her friends Ludmilla, Tomas and Leon as they learn what life is all about in Disney's musical television series, Violetta! Life is not always simple however for our protagonist as she has to re-adapt to life in her native Buenos Aires after having spent several years in Europe with her father. Returning to Buenos Aires, Violetta meets her friends Ludmilla, Tomas & Leon and the group set about making the most out of life as they navigate the trials and tribulations of growing up. This excellent poster featuring the four friends is not to be missed for fans of the hit Disney show. High quality, framed Violetta, Ludmilla, Tomas & Leon, Violetta poster with a bespoke frame by our custom framing service.